Because email is such an integral part of the workflow at ATILUS, streamlining email processes and making sure no important emails slip through the cracks is non-negotiable. But email management was an area where the ATILUS team struggled. The team’s inboxes were constantly flooded with emails—most of which were unimportant. The ATILUS team spent hours each day sorting through unnecessary emails, identifying which needed a response, and deleting emails that were taking up space in their inbox and preventing critical communications from getting immediate attention. The process of sorting through and filtering emails was time-consuming, hindered team communication and company productivity, and had a direct effect on profits. SaneBox has helped the Atilus team be more productive because we can spot the emails that matter and take care of them. ATILUS CTO, Harry Casimir, knew that in order for ATILUS to take their business to the next level, the team needed to take back control of their inboxes and figure out a way to cut down on the hours they were spending each day sorting through their emails. After some research, he found SaneBox and presented it to the CEO, Zach Katkin, as a possible solution to the company’s email management issues. After trying it himself, Katkin immediately saw how SaneBox could help his team increase productivity and get a better handle on their emails and started recommending the tool to his employees. At first, the ATILUS team was skeptical. “I was hesitant because I couldn’t imagine a tool being able to understand my inbox and how I need it to run,” says Bachmeier. But after exploring SaneBox’s features—and seeing the impact it had on her workflow—Bachmeier knew they had found the solution they’d been searching for and rolled it out to the rest of the team. Today, more than 60% of the ATILUS team uses SaneBox to manage their inboxes—and they’ve seen a massive spike in productivity as a result. “SaneBox has helped the Atilus team be more productive because we can spot the emails that matter and take care of them,” says Bachmeier. The ATILUS team is able to better manage their email and ensure they’re staying up-to-date on important communications thanks to the SaneLater feature. 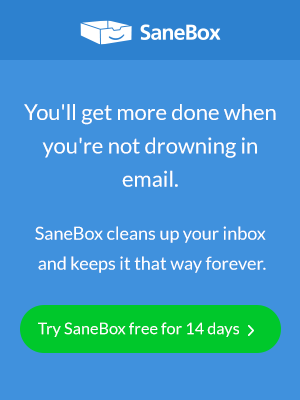 The SaneLater feature analyzes each user’s mailbox and email history and pushes important emails (like client communications and task reminders) through to the inbox while filtering less important emails (like social media notifications and pushy marketing messages) to the SaneLater box. This feature ensures that the most critical emails make it to the top of every team member’s inbox—and don’t get lost in a sea of newsletters, sales emails, and other messaging that just isn’t important. The ATILUS team is also better able to keep up with their workflow and stay on top of deadlines thanks to the SaneNoReplies feature. SaneNoReplies is a folder that automatically tracks every email a user has sent for the past 4 weeks that hasn’t received a reply. This tool has allowed ATILUS to better manage their clients and ensure no necessary responses or approvals fall through the cracks. “With the SaneNoReplies folder, I can quickly see which emails I haven’t received a response on and can then follow up with the client,” says Bachmeier.